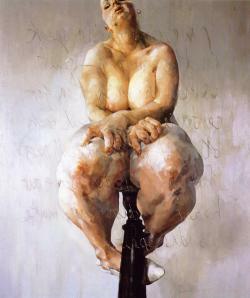 In a society often obsessed with physical appearance, Jenny Saville has created a niche for overweight women in contemporary visual culture. 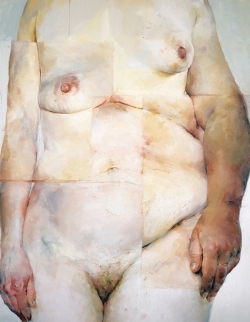 At Gagosian, the young British painter Jenny Saville has achieved something, er, Sensational. 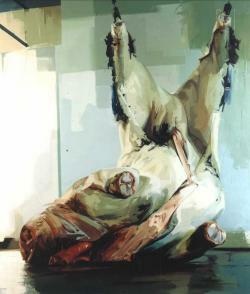 The nostalgic smell of oil paint fills the gallery, but we are not in for a walk down memory lane. Her huge paintings of female nudes are completely historical, even hewing to academic traditions, and still manage to question everything. 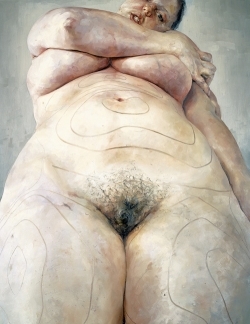 Saville's blatantly feminist subject matter - obese and sometimes faceless women whose vast bodies resemble mottled pink relief maps or hugely rendered versions of ancient fertility charms - partly originates in a trip to America made midway through her course at the Glasgow School of Art. 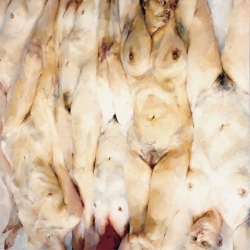 The images that had catapulted Saville into the international artworld were born from a fusion of her addictive love of painting and strong interest in feminist theory. 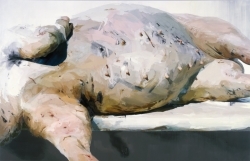 The paintings of Jenny Saville, the latest prodigy from the Freud-Bacon school of British fleshmongers, amount to a kind of anti-advertising. The vogue the 29-year-old English artist is enjoying is not simply the result of talent; many artists as skillful with the brush are routinely ignored. Nor is it a matter of her being more or less original. 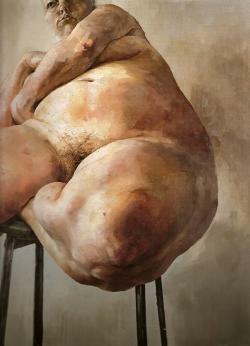 Saville is deeply indebted to other English artists, notably Lucian Freud, yet is not chastised for being derivative. 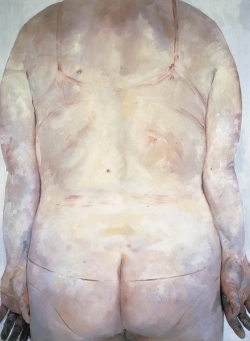 She is flourishing because she has found a way -- in her treatment of large nudes -- to give form to powerful underlying expectations in the art world about both art and the body.